Remember Sunday School? No matter your religion, you may have spent your childhood mornings in a classroom. 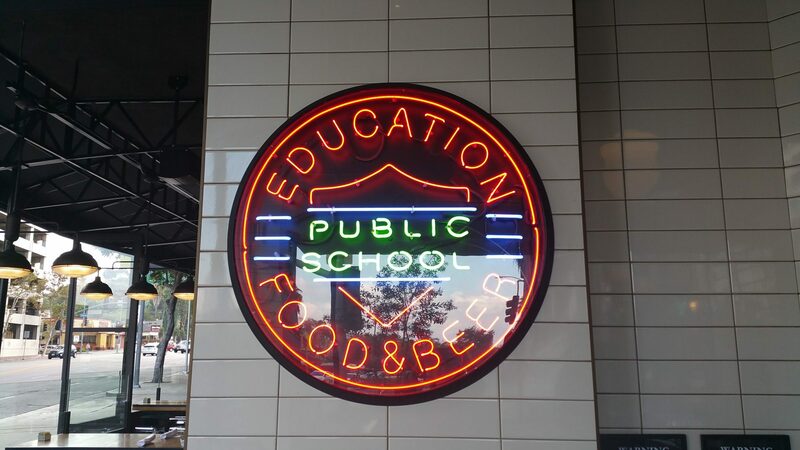 Now the classroom is the dining room at Public School, a chef-driven gastropub with a focus on “An Education in the Art of Food & Beer.” Time to head back to the classroom and spend your Sundays at Public School 818 for brunch, which scores high marks. Centrally located on the corner of Ventura Blvd and Sepulveda Blvd, Public School 818 is easily accessible from either end of the San Fernando Valley or a quick drive up the 405 from the city. With no traffic on Sundays, this is an easy A. 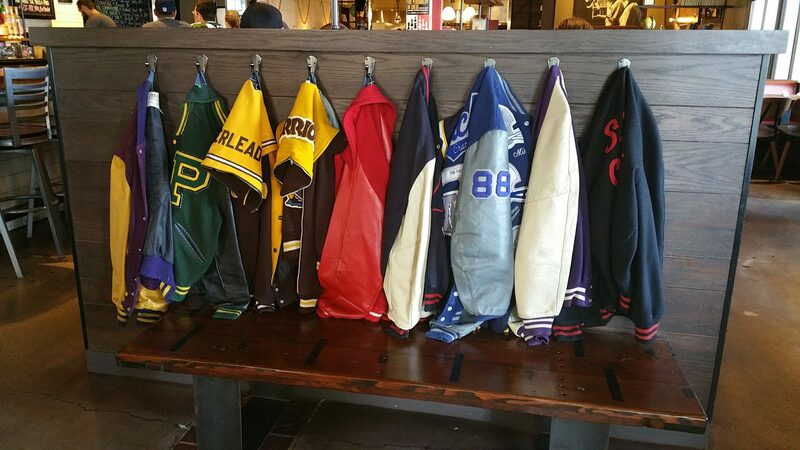 Every detail at Public School 818 will take you back to high school – from the Letterman jackets hanging at the entrance to the composition notebook menu to the lined paper napkins and the scantron brunch menu. 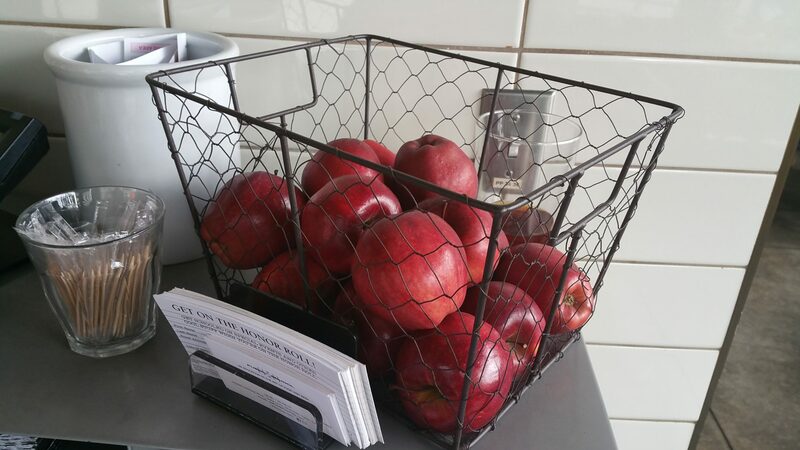 There is even a crate of apples at the door, but instead of for teacher, they are for you, if you would like one. Our server was friendly, cheerful and helpful with suggestions. She checked in on us and kept the water glasses full and re-poured the coffee but also let us sit and enjoy our conversation. Public School’s full bar serves craft beers, cocktails and wine, and on Sunday offers a drink menu perfect to start the day and at a great price. 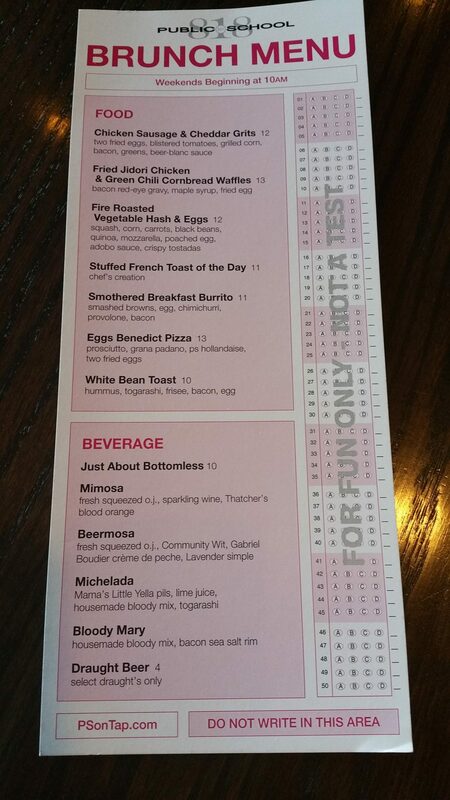 Mimosas, beermosas, micheladas and bloody mary’s are only $5 and if you order bottomless, it is only $10. You really can’t beat that price for drinks. 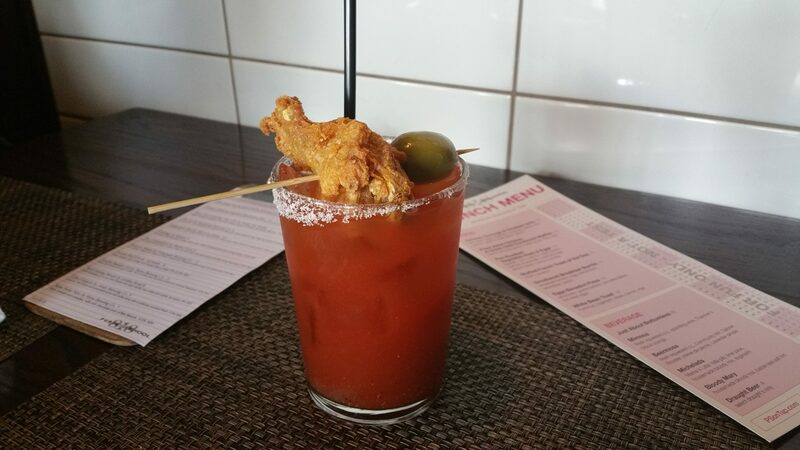 Bloody Mary (housemade bloody mix, bacon sea salt rim) – This bloody mary, with a fried drumstick and olive, is just the right level of spiciness. 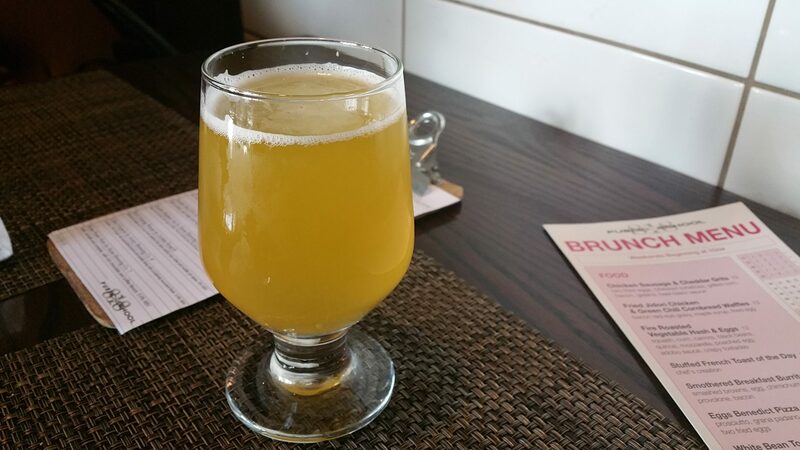 Beermosa (fresh squeezed oj, Community Wit, Gabriel Boudier creme de peche, Lavender simple) – More subtle than a traditional mimosa, the beermosa is smooth with a hint of sweetness from the creme de peche. Go bottomless on this one as you will want more than one glass. A chef-driven gastropub, the brunch at Public School is not for those on diets. These are the hearty dishes you want to enjoy after a long night out the previous evening or after a very intense morning workout. The dishes are full of flavor and will satisfy either diner. 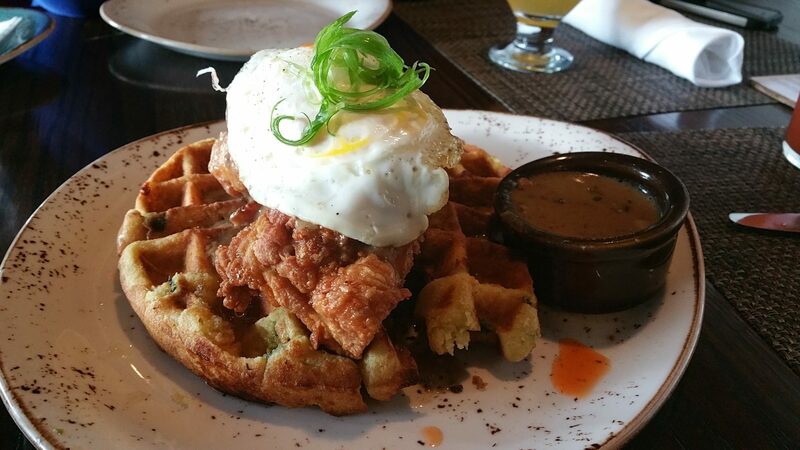 Fried Jidori Chicken and Green Chili Cornbread Waffles with bacon red-eye gravy, maple syrup and fried egg. The waffles are more bread-like and savory and the chicken has a nice crispy outside while the meat is tender. 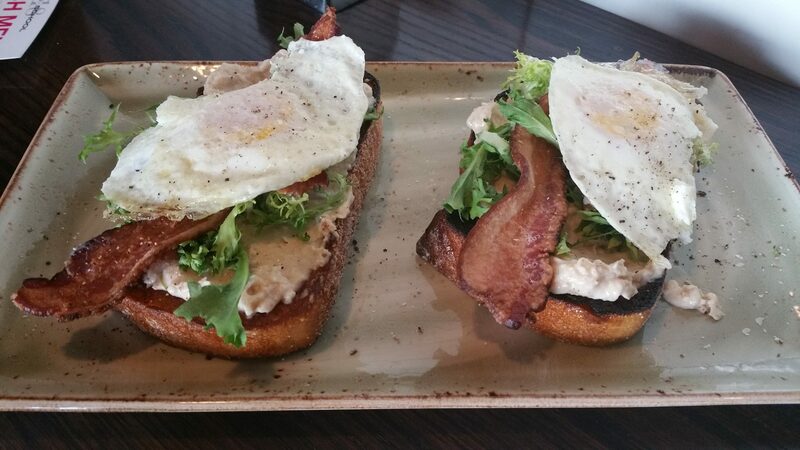 White Bean Toast with hummus, togarashi, fresee, bacon and egg. This open faced sandwich is on a thick piece of soft bread and is one of the lighter dishes on the menu but was also one of my favorites. 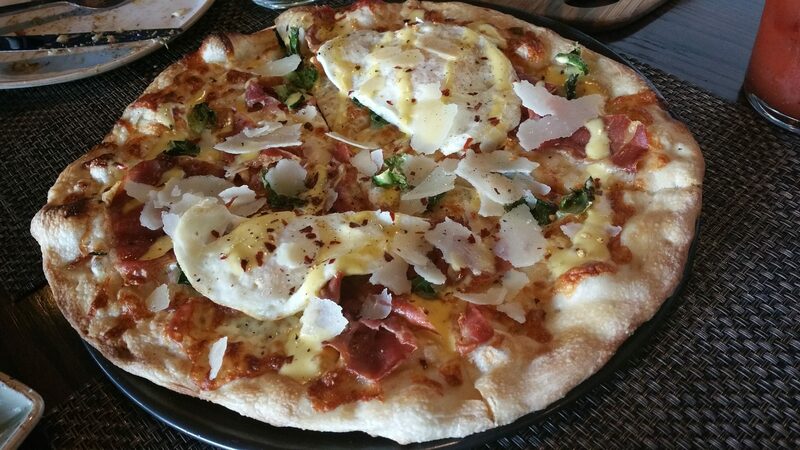 Eggs Benedict Pizza with prosciutto, grana padano, ps hollandaise, two fried eggs. Less rich than a typical eggs benedict, there is a little added spice from the chili flakes on this pizza. 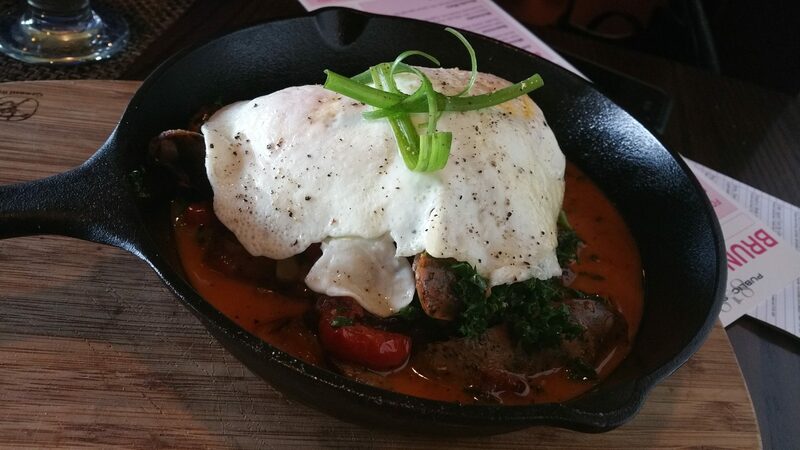 Chicken Sausage and Cheddar Grits with two fried eggs, blistered tomatoes, grilled corn, bacon, greens, beer-blanc sauce. If you can’t make it to PS818, there are five other locations and counting. Downtown Los Angeles (213), Culver City (310), Thousand Oaks (805) are the other locations in Los Angeles and there are also locations in Dallas, Texas (214) and Las Vegas (702). 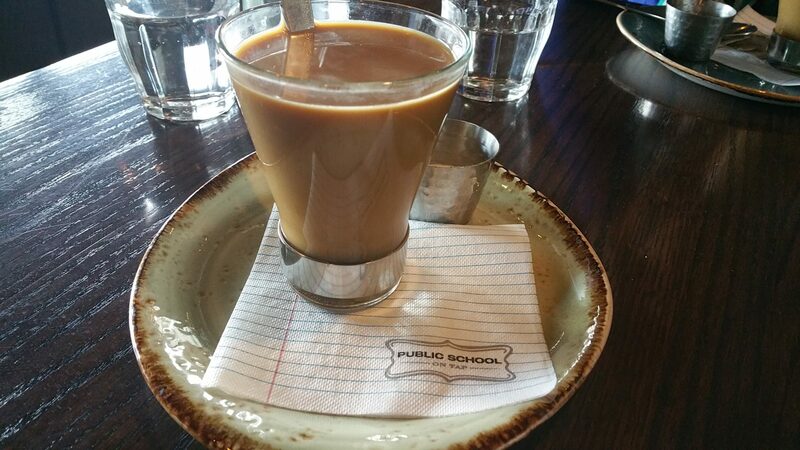 So, head back to school and enjoy brunch at Public School in an area code near you! This entry was posted in Cocktails, Food and tagged beermosa, Bloody Mary, bottomless drinks, Brunch, brunch menu, PS818, Public School 818, Sherman Oaks, sunday brunch by Allison Levine.